A must-read for die-hard St. Elsewhere fans: a chapter on the show in Robert J. Thompson's Television's Second Golden Age. I've mentioned this book on this blog several times, as it's one of the best sources of background information on St. Elsewhere. 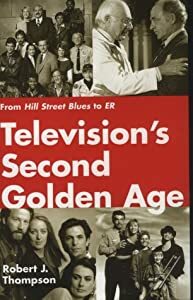 Robert J. Thompson's Television's Second Golden Age discusses the emergence of the "quality television" movement that grew out of MTM Enterprises and their commitment to sophisticated television in the 1970's. After I discovered St. Elsewhere in the late nineties and became obsessed with the show, I bought this book, which was published in 1997, as it appeared to be the only book that had any information on the show. It was the first thing I ever bought through the fledgling e-commerce website, Amazon.com. Thompson, probably the most oft-quoted television scholar, devotes entire chapters to MTM's Hill Street Blues and St. Elsewhere, and he gives the latter high praise as one of the most significant shows in the history of television for its innovation and envelope-pushing. Now, thanks to Google Books, you can click the link in this sentence and read the entire chapter on St. Elsewhere for free online. It's a must-read for any St. Elsewhere fan, and it's where I learned to appreciate much of what the show has to offer. Of course, if you're a fan of great television and curious about where it all came from, I'd encourage you to buy the whole book, especially if you're a fan of Hill Street and other MTM shows.